Kirby and Peach going through the Sea of Clouds. Sea of Clouds (雲海, Sea of Clouds) is the 3rd level in the Subspace Emissary in Super Smash Bros. Brawl. The level starts off with Kirby and either Peach/Zelda, depending on which princess was saved in the Midair Stadium, riding on Kirby's Warp Star through the sky. They then land on the Halberd. After choosing whether to play as Kirby or Peach/Zelda, the player walks across the Halberd with no chance at failure. In the next cutscene, an Arwing is weaving its way through weapons firing from the Halberd. The Combo Cannon sends its arm up towards the ship and connects with it. The ship falls into a crash course with Kirby and the princess, barely missing, but the slipstream from the near-contact is so strong it sends both characters flying off of the ship. 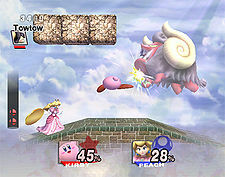 As Kirby and the princess fall through the clouds, the player picks one of them again. The player will need to head to the right when the stage starts. They will run across a couple enemies and then some blocks that they can break by just hitting them. As they continue on, the player will then weave back and forth a bit until they see a turquoise cube on the right that they can grab. they will then keep left and down. As the player continues left, they will eventually come across a Towtow. The player keeps going left, then will run into some breakable blocks in mid air. Instead of destroying them, they will climb them to a hidden door up above and enter. The player will find a couple of turquoise cubes for their own pleasure. After acquiring the contents of the cubes, they head back through the door and continue down and left. The player then dispatches any enemies to prevent a chase to breakable blocks and having to attack them there all grouped together. After breaking the blocks, the player continues on down the path. If they keep heading right, they can grab a random item or just continue on down the path going left. The player can then drop down, head right, and sprint to a door at the end and enter it. As the player heads right, there will be a group of Spaaks. They will have to defeat them before they overwhelm the player. When the player sees the arrow pointing left, they will instead go right down into the pit to find a turquoise cube. They will then go back and follow the arrow. A forced battle with a portal producing Mites will appear. The Mites themselves are not very powerful, but they will spawn indefinitely until the portal is defeated. As the player continues left, they must watch for falling soil as it is a sign that a large rock will come falling down. They will then continue and climb the platforms trying to dodge the Glunders on top of them. As the player continues to climbing them, they will find a green cube at the top. The player heads down, and will be sent into a forced battle with a portal sending out Mites and Glunders. After destroying the portal and the enemies it spawned, the player can continue on. More rocks will fall and more enemies will appear in an attempt to impede progress. At the end of the path to the right, the player will meet a Greap. Defeating it reveals the gold door to complete the stage. The only music that plays is Skyworld. Even in the first playthrough, if Zelda is rescued in Midair Stadium from Petey Piranha, the player can choose to play as Sheik via Transform, despite the cutscenes picturing Zelda instead. This is one of the two pre-Subspace level which features background music not from the universe of the characters that went through it, the other being The Swamp (Kid Icarus on a level with Kirby and Peach or Zelda). This page was last edited on December 31, 2017, at 12:45.